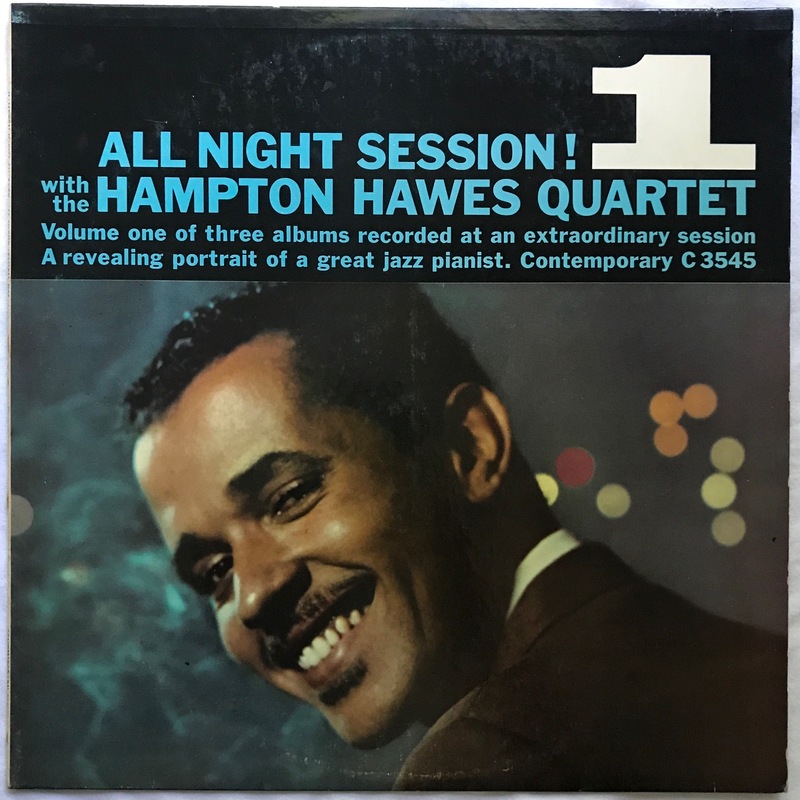 Hampton Hawes, a fellow Californian, may be closely tied to West Coast jazz, but there’s nothing cool or relaxed about his playing. Especially on this series of records, his playing sounds more like a horn, spitting out line after line of percussive piano. Only the easy swing and the presence of Jim Hall’s laid-back guitar remind you that this was recorded on the Best Coast (no typo). 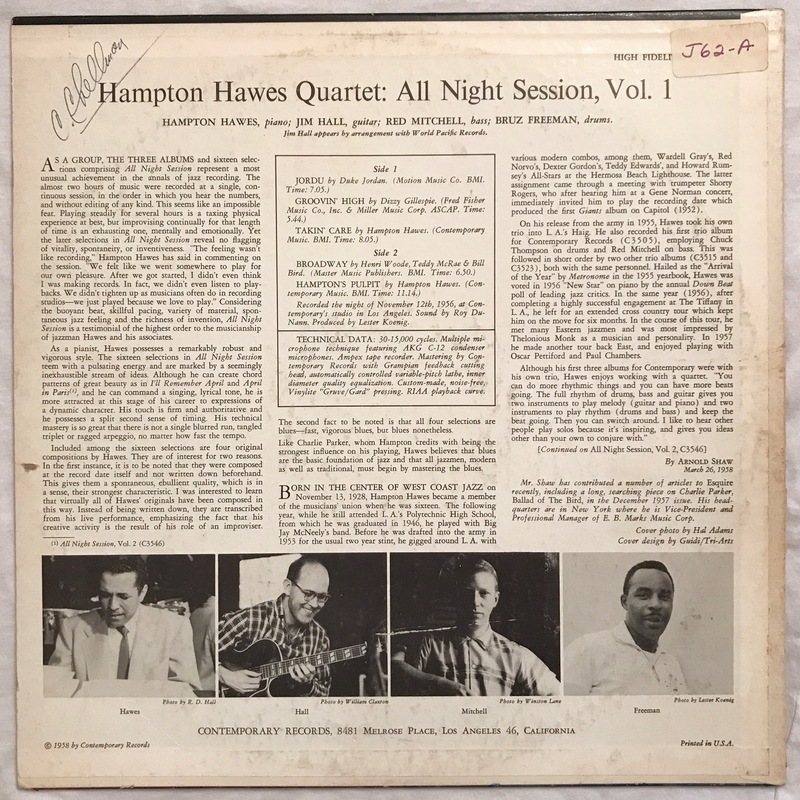 This record is one of three volumes of music made at one late-night recording session, according to the liner notes and legend. According to the same liner notes and legends, the tracks on the records are in the same order that they were recorded in the studio that night. If that’s in fact true, then the tune ‘Jordu’ was the song that got everything started. ‘Jordu’, written by another pianist by the name of Duke Jordan (see what Duke did there?) gets off nicely. Hampton takes a few choruses, turning up the heat and number of notes each go-round. Jim Hall’s soft comping in the background comes to the fore when he takes his solo. Hall became a respected guitarist in his own right, but in 1956 he was still a mostly unknown sideman outside of the Pacific Coast, his big claim to fame at the time being a charter member of Chico Hamilton’s popular group with a cello. Bassist Red Mitchell was another bassist that was well-known on the West Coast but not much else, but don’t let that lack of notoriety fool you. He was a swinging bassist and had no shortage of gigs and studio work. I must admit though, I had no idea who Bruz Freeman was. Turns out he was a replacement for Hawes’ regular drummer Chuck Thompson, who was out of the band due to his drug addiction. Another one bites the dust. Bruz was a no-frills drummer who appeared on a few albums throughout the 1950’s and 60’s. the liner notes take up most of the room. The blurb about the author of the notes, Arnold Shaw, mentions that he wrote a “long, searching piece” in a magazine, which sounds like a short, subtle jab to me. It definitely describes the notes, especially when one realizes that Mr. Shaw kept up the full-length notes for three albums. It would have been helpful to have the liner notes on the albums to pertain to the music on the actual record inside, but that’s not the case. I suppose they figured that the consumer would buy all three albums. Contemporary was on the ball when it came to information about the actual recording sessions that made up their albums, including not just the personnel but the recording date AND location! As if that wasn’t enough, they even blessed the record buying public with the technical data, such as microphone names and techniques. They weren’t messing around. Based on the address on the bottom, this is most likely a first pressing, recorded in 1956 and released in 1958. This record has the classic yellow labels, pressed on heavy vinyl with a deep groove. Combined with the info on the back of the album cover, everything points to a first pressing… but the stamper in the runnout isn’t D1. Side 1 has ‘LKL 12-113-D2’ and side 2 has ‘LKL-12-114-D4’, which apparently means it’s a reissue. Who knows. As far as the sound of the record, it sounds wonderful. Roy DuNann, Contemporary Record’s ace sound engineer and the West Coast’s answer to Rudy Van Gelder, made some beautiful sounding records, recording in stereo as far back as 1956. As a result, there are allegedly stereo versions of this album series out there in Vinyl Land. This album, released in glorious mono, sounds a bit compressed but the vinyl plays pretty quiet and clean for a 60-year old record. The local record store continues to bless. I found all three volumes of the series in the new arrivals of the jazz section and almost hollered. When the vinyl gods shine on you like that, you don’t hesitate, cogitate, ruminate, or formulate. You snap them up before someone else does. Luckily, the price tag for all three was within the college budget at $28.